With 700 million active users, the Messenger team claims to have made mere "baby steps" towards their ultimate goal. 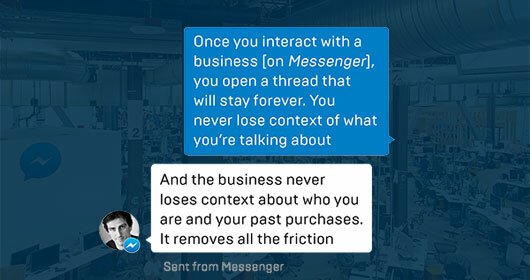 Take a look at the future of messaging, and how it could reinvent and dominate our interactions with businesses. Google’s answer to Facebook’s Instant Articles, this new open source initiative aims to overhaul performance on the mobile web. The AMP HTML framework helps publishers optimise once, and have lightning-fast content everywhere. Twitter’s on board already. Ben Evans takes stock of the evolving mobile landscape and discusses the web vs apps vs the operating system. "We're now unbundling apps, search and discovery into the OS itself" – and whoever owns the OS has the power. “You can iterate your way to lots of places, including mediocrity.” Des Traynor warns against diving into the details too soon. Embedding designers is the first step, but spreading design literacy through everyone in your team is the key to infusing design into an organisation's DNA. “The New Logistics grapples with the irony of melding extreme efficiency with humanistic concerns of autonomy and delight.” Peter Melholz discusses how logistics have emerged from the shadowy depths of businesses, to the forefront of customer experience. “Can a couple of chimes and pops actually convey something complex?” The Verge talk to Listen, designers of audio cues in the new Skype, and give us a history lesson on interface audio along the way. Enough of the words, more of the pictures? 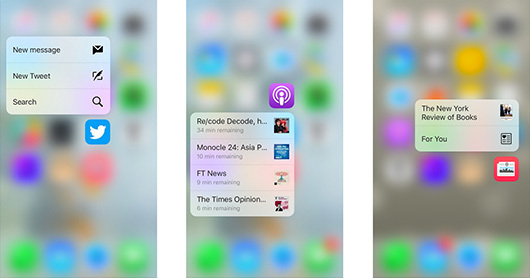 The good folk that bring you Material Up now curate UI details from iOS too.